Newly independent Covestro is excited about waterborne Insqin™ polyurethane technology and partner program. ollaboration, investment and strong — three words combined to create the name Covestro, the new identity given to the Bayer AG company Bayer MaterialScience after it was separated from the parent company last year. Covestro AG is now a legally and economically independent entity with its headquarters in Germany. It is very much a global company however with manufacturing and research locations all over the world. The separation from Bayer allows the company to leverage its existing strengths more rapidly and flexibly across the globe. Additionally, as a separate entity, direct access to capital markets allows the company the strategic freedom to capitalize on growth opportunities. Covestro is divided into three business units: Polyurethanes; Polycarbonates; and Coatings, Adhesives and Specialties. The company operates three main global innovation centers — one in Germany, one in Pittsburgh and one in Shanghai. Covestro is involved in many areas of polymer science, and has a group dedicated to textile innovations. Its global Textile Coatings business unit is headquartered in Shanghai, and at the Polymer Development & Research Center in Shanghai the Textile Coatings group focuses on Insqin™ technology for polyurethane (PU)-coated textiles. Polyurethane-coated textiles are suitable for a variety of end-uses including fashion and sport shoes, bags and fashion garments. Covestro offers polyurethane dispersion (PUD) chemistries to both enhance and transform textiles. PU can enhance textiles when used as a waterproof coating and is commonly used in T-shirt printing inks. Used in a different way, PU can transform fabrics into materials suitable for bags, shoes and fashion garments. The transformed textile is soft and durable and offers endless possibilities for design and color not available with natural materials like leather, according to Covestro. Effects such as glitter, metallics, as well as deeply embossed patterns are just some of the design possibilities. Traditional PU technology requires the solvent dimethylformamide (DMF) to be used during processing, which creates occupational health risks, as well as environmental pollution risks. Production involves a three-step process that creates a base layer, prepares a skin layer using a transfer coating process, then laminates the two layers together. The traditional process also requires large amounts of water during the washing stage, and high levels of heat to dry the substrate and recover the DMF. It is an energy- and resource-intensive process. According to Nick Smith, vice president and global head of Textile Coatings, Covestro (Shanghai) Management Co. Ltd., the textile industry’s agenda is increasingly dominated by sustainability. Organizations such as the Sustainable Apparel Coalition, the Roadmap to Zero Discharge of Hazardous Chemicals (ZDHC) group, and Afirm Group that share visions of reduced environmental impacts caused by the textile, apparel and footwear industries encourage textile companies to rethink they way they operate. Covestro was driven to develop a more environmentally friendly process and DMF-free chemistry for PU products. The company’s goal was to create a product that was sustainable, but one that did not hinder innovation. That idea resulted in the launch of Insqin, which is a ZDHC, bluesign® and Oeko-Tex® compliant product. Insqin encompasses a range of waterborne PU dispersions and offers three principal benefits according to Covestro: it results in a safer working environment; eliminates the pollution risk; and is more efficient. The company was able to retool the manufacturing process into a sequential build-up on the same line, thereby eliminating the traditional three-step process. Covestro also engineered waterborne chemistries that took DMF out of the equation, removed the need for post-treatment washing, and reduced the total drying time to make the whole process much more environmentally friendly and less energy intensive. According to Rolf Irnich, head of Global Technical Development Textile, Covestro Polymers (China) Co. Ltd., the Insqin process saves 95-percent of the water required in the traditional DMF PU production process and 50-percent in energy costs. Additionally, the waterborne PU can be coagulated without the need for DMF, so this chemistry may be implemented by a traditional PU producer using the three-step process. The Covestro Polymer Development & Research Center in Shanghai recently installed a state-of-the-art pilot coating line with a 12-meter-long oven and built-in embossing line. This 3 million euro investment is used for Insqin product development and partner company trials. According to Smith, Covestro discovered through dealing with brands that they were concerned about transparency in the value chain. The company saw a chance to improve and promote transparency, which led to the creation of its Partner Manufacturer Program. Launched in July 2015, the program helps brand owners find reputable manufacturers of sustainable materials. The program is voluntary, and a manufacturer must submit to an audit performed by a third-party testing house to join. The incentive for the manufacturer to be highly scrutinized in this way is to gain access to proprietary Covestro technology and be represented downstream by Covestro with the brands looking for responsibly produced PU products. Covestro developed an integrated approach to the market with its Insqin Partner Manufacturer Program. As the chemical supplier, Covestro does not deal directly with the brands, but feels the relationship is important. “The brand owners will never buy a single kilo of product from Covestro, but we want that relationship,” said Smith. Smith reports strong interest from brand owners in the technology, and even more interest from the manufacturers. “However, we’re in the early stages of the market introduction of the technology, and many wait for market demand before getting involved,” Smith said. Korea-based Duksung Co. Ltd. was the first company to sign an Insqin partner agreement. Established in 1966, the company specializes in man-made and synthetic leather production. Some of its latest innovations have extended to PU-coated yarns, which are woven into fabrics with improved abrasion resistance. 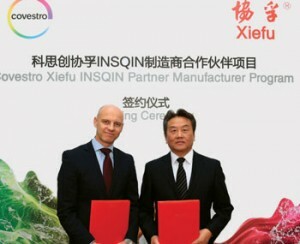 Nick Smith (left), global head of Textile Coatings at Covestro, and Xue Taiwen, general manager and director of Kunshan Xiefu New Material Co. Ltd., at the recent signing ceremony for the Insqin Partner Manufacturer Program. Covestro recently welcomed China-based Kunshan Xiefu New Material Co. Ltd. (Xiefu) as the second member of the partner program. A signing ceremony was held to officially welcome Xiefu into the program. The two companies will collaborate to develop and promote sustainable PU materials for fashion and footwear markets, among other applications. Xiefu’s customers include H&M, Zara, C&A and Emmaljunga, a Sweden-based manufacturer of high-end baby buggies and prams. “We are proud to welcome Xiefu to the program and look forward to supporting the growth of sustainable PU-coated textiles for the fashion apparel and footwear market worldwide,” Smith said.